We are so grateful to everyone who supported Raju from near and far. Now that Raju's future has been secured, we can all turn more of our focus onto our new campaign to rescue all of India's 67 circus elephants. When Raju was rescued in July, 2014, his story caught fire and was covered by major news outlets around the world. 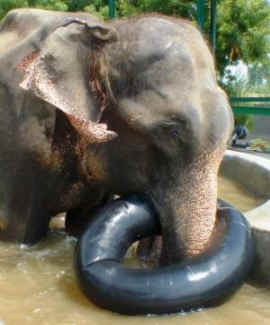 After 50 years of brutality, and as many as 27 "owners", Raju was finally free. But then, just a few short months later, the man from whom we had taken Raju, Mr. Shahid, filed court papers in an attempt to get him back. We were determined to never let that happen. The public agreed, and hundreds of thousands of people signed a petition requesting that he stay safe with us at Wildlife SOS. 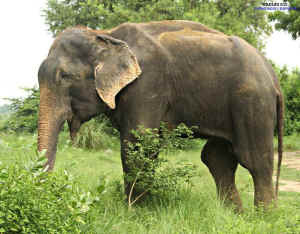 Now, we are thrilled to report that Raju will remain free! After multiple postponements, Raju's case was finally heard earlier this week, and the judge ruled in our favor. Mr. Shahid was represented by his lawyer, who argued for the return of Raju. However, Wildlife SOS lawyer Mr. Vashist submitted substantial evidence and precedence of other cases of cruelty to elephants to the Honourable Court. Wildlife SOS lawyers representing the Forest Department also submitted that Mr. Shahid did not have any legal documents to confirm his legal procurement and ownership of Raju. After a heated debate and arguments, the court finally dismissed Mr. Shahid's claim that Raju was his property on the grounds that he did not have grounds for this claim. “We are beyond overjoyed that Raju is finally saved. This is a huge victory, not only for Raju, but for every elephant suffering in pain silently," said Kartick Satyanarayan, co-founder of Wildlife SOS. “We were determined to fight for him to ensure he could live out his days free from beatings and harm and we've had many a sleepless night worrying about what the future held for him. We are so grateful to everyone who supported Raju from near and far. Now that Raju's future has been secured, we can all turn more of our focus onto our new campaign to rescue all of India's 67 circus elephants. If you would like to support this campaign, please make a donation today - WildlifeSOS!